Step back in time. It’s 1997 at BigPrint, and this company is rockin’. Sales and profits keep rising. The customer base is growing and many buyers have the title, “Print Production Manager.” Blackberry just became a public company, but there still are two years before it introduces a revolutionary product allowing salespeople to call people and see their emails on the device. There are plenty of big jobs to bid on – catalogs, mailings, annual reports – most with decent margins. Believing there’s plenty of new business to be had, the president of BigPrint, Bob Jones, believes the smart way to grow is by hiring more salespeople. Most companies have a corporate brochure, but very little other marketing literature. Salespeople conduct most of their prospecting on the phone, and hunt and farm to build a book of business. The sales team finds leads, makes cold calls to get meetings, works to convert prospects, manages accounts once they’re sold and penetrates them. Few salespeople sell solutions, but no one on the BigPrint management team worries about this because there’s plenty of available transactional business. On average, it takes about 30 to 45 days to get a meeting, and about 60 days to convert a prospect. The sales compensation model is commission-based. Bob loves this model because he believes everyone in sales is money motivated. Now, fast forward to BigPrint in 2017. Growth is stagnant and there is tremendous pressure on profitability. The title, “Print Production Manager,” has gone the way of the dinosaur. Everyone on the sales team uses a smartphone to call, text, email and access their social media. Since 2007, BigPrint has experienced shrinking print budgets and a reduction in the dollar size of the average print job. All around, there are fewer big jobs to bid on, and all margins are slimmer. In 1997, Bob expected his team to find leads, make cold calls to get meetings, convert prospects, manage accounts once they’re sold, and penetrate them. Today, he also expects them to send emails and maintain a presence on social media. Bob acknowledges that in 2017, it is extremely challenging to get prospects to pick up their phone. He admits that sales cycles are significantly longer, and more touches are required to get the first meeting. With a reduction in the average order size, he knows his salespeople must build and maintain a broader base of clients and process more transactions for the company to grow. His team admits that they spend very little time prospecting, but since they are 100 percent commission, Bob has had little success convincing them to change. Bob recognizes the system he has in place to produce revenue growth doesn’t work as well as it once did. To thrive, BigPrint needs to make changes. Describe where you are now. Decide where you want to be. Identify the gaps. For example, let’s say your team is good at converting prospects when they get the first meeting, but they don’t get many first meetings. To grow, you need to close this gap. First, identify the desired outcome. Is the sales team currently getting three meetings with customers per month, but you need them to get 10 a month to grow? There always is more than one route to a successful outcome. Come up with multiple solutions, and then evaluate the pros and cons of each one to determine the best fit for your company. Getting a first meeting is a complex process and involves many distinct skills, including building rapport, overcoming objections and persuading people to agree to meet. 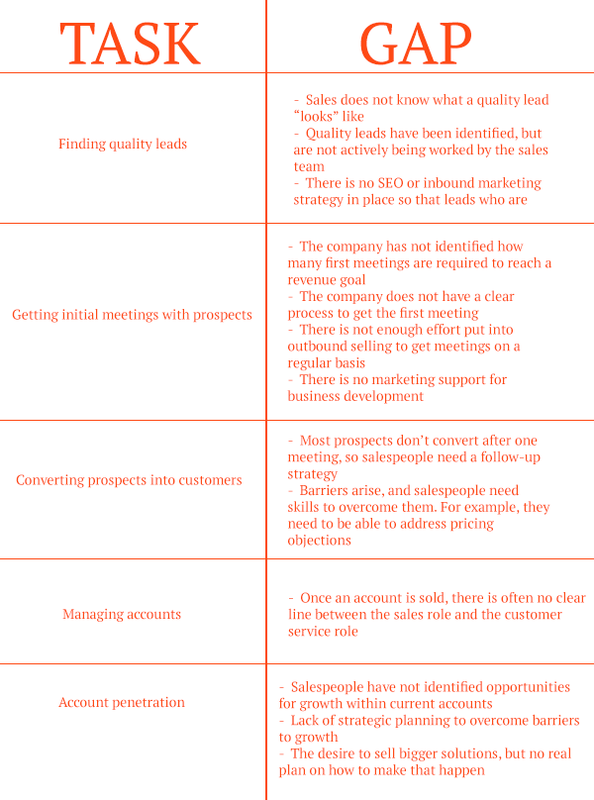 Converting a prospect into a client also is complex. You must manage time to follow up and follow through, find opportunities and close the sale. Penetrating a customer involves another set of challenges, where salespeople must excel at building relationships, servicing, identifying new opportunities, and finding new ways to bring value. Companies that adopt a specialist approach can build a team where individual members stay focused on their purpose, whether it’s developing a base of leads, appointment setting, business development or account management. I think it’s the right approach for the 21st Century. Why? Because there’s a lot that must be done to build a repeatable revenue process. Only an elite few will be good at everything, so narrowing the bandwidth of responsibilities increases the odds of getting them done. Ben Franklin said, “When you’re finished changing, you’re finished.” Whether or not the Specialist Approach is right for you, it’s good to take the time to look.